Pregnancy is a wonderful and life-changing experience for most women. In nine months, your body is working full-time, using all the necessary resources, to nurture a new life growing in your womb. 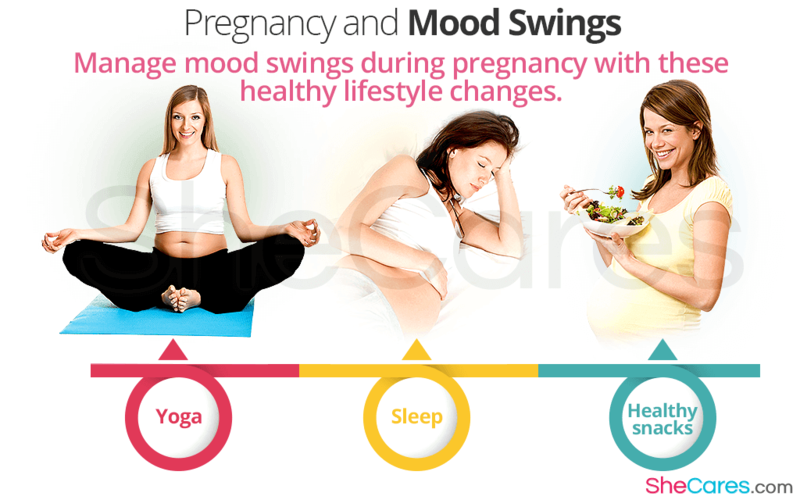 But there is also a less pretty face of pregnancy: the mood swings. Continue reading to learn about the nature and causes of mood swings during pregnancy and the ways to cope with them. Mood swings are rapid changes in mood, characterized by sudden bursts of anger, irritation, crying spells, euphoria, states of hopelessness, all in a short period of time with no apparent reason. Why Do Mood Swings Occur during Pregnancy? The main reason for mood swings during pregnancy is hormonal fluctuation, particularly of estrogen and progesterone. Their shifting levels can make you more vulnerable to mood shifts, as well as other physical symptoms, such as fatigue or nausea, that can also affect your emotional stability. Mood swings can also be triggered by the worries and doubts that all parents-to-be go through. The thought of becoming a parent and being responsible for a new human being can sometimes be overwhelming. The financial aspects can also become the source of great stress, capable of making you more easily irritated. Do Mood Swings Occur in all Trimesters? Most women experience severe swing moods during the first trimester, when hormonal changes are very intense. In those first three months, your body is adjusting to this new state, and the morning sickness and forgetfulness, commonly called “baby brain,” are a common occurrence and can make you feel miserable. The second trimester is usually calmer; in fact, many women feel their best during those few months, but the occasional mood shifts continue to occur. During the third trimester, however, mood instabilities tend to be more pronounced once again. A nesting hormone, called oxytocin, prepares your body for nursing your baby and also increases your urge to organize and prepare the surroundings for his or her arrival. Moreover, anxiety and stress naturally rise as you approach the due date, increasing the risk of moodiness. How to Cope with Pregnancy and Mood Swings? Pregnancy and mood swings are not typically treated with medications. Various alternative methods are recommended instead, because they are safer for you and the baby. Check if there are prenatal yoga or meditation classes in your neighborhood to reduce stress and calm your mind. Also, ask your doctor what kind of exercises are right for you as they can cause an influx of “happy hormones” to enhance your mood. An important step in managing mood swings during pregnancy is understanding that they are normal and beyond your control, so you should not feel guilty about them. Sleep and rest as much as your body needs, because insufficient amounts of sleep can make you more tired and irritable. Keep a stack of healthy snacks handy to help you maintain your blood sugar levels stable and prevent sudden mood swings. Although mood swings are a natural part of pregnancy, sometimes they can indicate a more serious condition. Up to 15% of pregnant women suffer from depression or anxiety disorder during pregnancy, which should be properly evaluated by a mental health professional, especially if it causes persistent thoughts about harming yourself or the baby. Mood swings during pregnancy can also be a sign of hyperthyroidism, gestational diabetes, or anemia, which can be easily diagnosed with a blood test and adequately managed with medications to make sure you and your child are healthy. Understanding that mood swings are perfectly normal during pregnancy can help you (and your partner) manage them with more ease, without letting them take control over your life. This emotional roller coaster is only temporary and will pass, so focus all your energy on keeping yourself healthy and well-nourished throughout your pregnancy.